We flew to New York on Friday. The apartment we had rented wasn’t ready, so we got lunch. For dessert, we ended up at the Cake Boss Cafe at 42nd Street and 8th Avenue. This was a big hit with the girls, who are fans of the TV show. Robin had a cupcake, which was good but not, of course, as good as the ones from the Cupcake Bar. After we finally got into the apartment — if I ever rent one again, I’ll be sure to find out the check-in time — we headed for dinner at Maria Pia, one of those neighborhood Italian restaurants of which New York has so many. 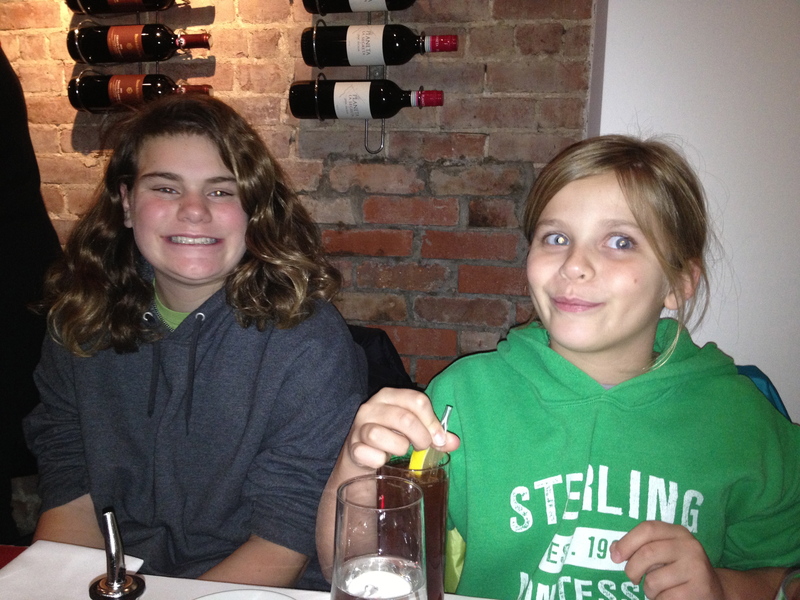 The girls were able to get their usuals, salmon for Sophia and noodles for Annika. Then it was off to our first cultural event, the Gazillion Bubble Show. This proved to be about 85 minutes of a woman on stage doing all sorts of tricks with soap bubbles. At one point she had four children encased inside one giant bubble. The girls loved it. I fell asleep after about half an hour, but remember: I wasn’t feeling well. It’s a great show for kids. Saturday morning we were up early to catch the Circle Line cruise. We opted for the one-hour Liberty Cruise, which goes down to the eponymous statue and back, rather than full circumnavigation of Manhattan. As always, the Circle Line provided an extremely knowledgable guide who gave us a lot of background of what we saw, which included Ellis Island and the new World Trade Center building. Sophia enjoyed the tour, but Annika was a little bored. She liked the Statue of Liberty, however, but she did declare that she already knew everything the guide told us about it. We had planned to grab some New York pizza and head to the Empire State Building after the cruise, but the girls were tired and Robin and I were battling our colds, so we went back to the apartment to veg out. Mid-afternoon we headed to our next cultural event: a concert by the New York City Community Chorus at the Church of the Holy Apostles on Ninth Avenue. My sister Nancy was a member of this chorus during her five years in Manhattan, and we have stayed in touch with it since. The chorus operates on the theory that anyone can sing (they haven’t heard me), and no auditions are required to join. This was the 20th anniversary concert and included a tribute to departed members, including Nancy. It was a lovely program of Christmas and Hanukkah songs (or as we call them, Annika songs). 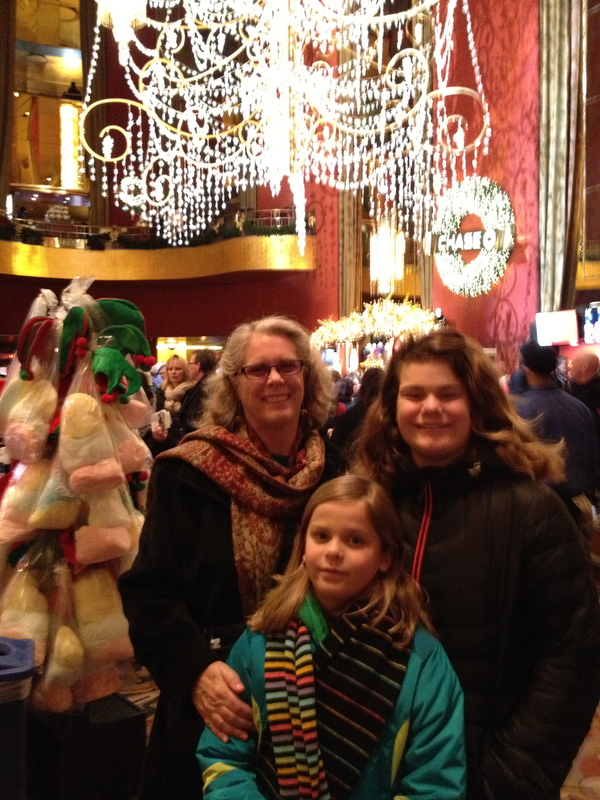 The girls enjoyed the concert — especially Sophia, who is a member of her school chorus — and there were snacks afterward. After the show, we headed over to Rockefeller Center to check out the Christmas tree, visit the Lego store (extremely crowded), and watch the ice skaters. The girls wanted to skate, but it was a two-hour wait, so we decided to skip it. We had lunch at the Sea Grill, which has a great view of the skaters. After lunch, we strolled toward Central Park, with a stop at the American Girl store on Fifth Avenue, where purchases were made. We checked out the Plaza Hotel and the store windows at Saks and Bergdorf Goodman and watched some break dancers who were performing just outside the park. The girls were quite taken with their act, which ended with one of their number leaping over several “volunteers” dragooned from the audience. 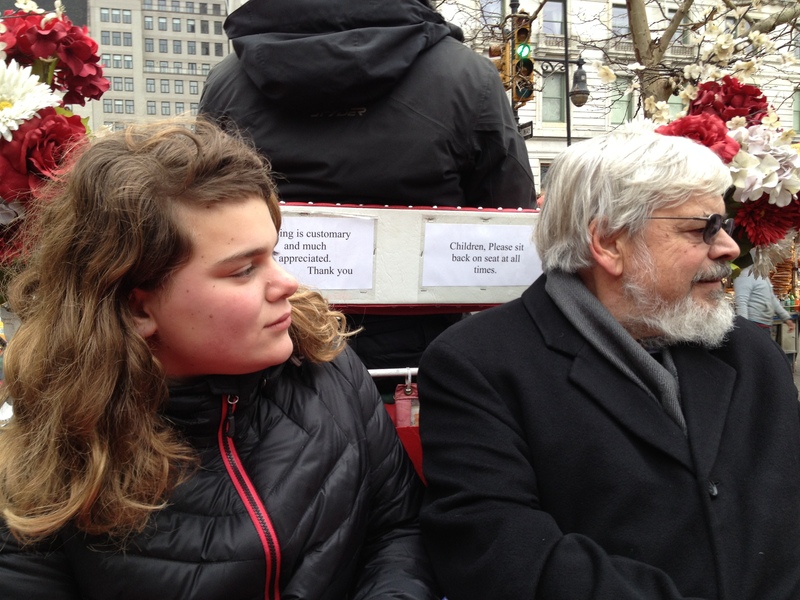 We took a carriage ride through Central Park, courtesy of a horse named Marcello. The ride was more interesting than I expected, as our driver told us about various sites, including movies that had been filmed at various locations. We made a final stop at FAO Schwarz, where more purchases were made, and where I was disappointed to learn that it is now owned by Toys R Us. Bon voyage (the French have a different word for everything)!